We love our library too! This is such a great idea! I love our library! I would be broke without it! I love seeing people support the library. I am about to graduate with my master's degree in library and information science to become a librarian. I graduate in the summer! Thanks for doing this! I take my daughter to the library for story time every week and can't wait for her to get her very own card. Libraries are essential to promote community, education, resources and more. Great idea. My girls and I love going to the library. Fantastic! The library rocks! I hope you get a lot of comments! Well, what's not to love? I agree with LutherLiz. That's why I never complain about having to pay a fine for overdue books, etc. Happy children at the library - I love it! I am delighted to help contribute to Wisconsin libraries! Wonderful idea! I hope you get all 100 comments! Good Luck! We visit our public library frequently. What an awesome idea. I need to check with my library. It is my favorite place to take my grand-daughter. She gets so excited when she knows we are going. What a great idea to raise funds for your library. We also love going to the library and attend story time. Life would not be nearly so wonderful without the library! Wonderful idea, Ma'am! We don't get there nearly often enough =( BUT, how about I do half as much as you? For your 100 comments, I will donate $25 to the local library--in YOUR name, Darling!!!! Just let me know when I should drop it off b/c I KNOW you'll get the 100!!! 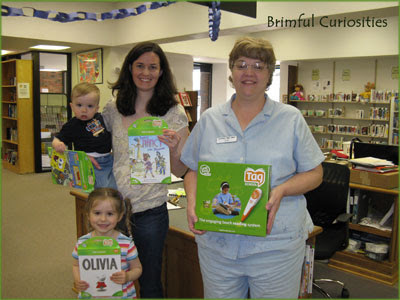 Libraries are such a great resource, especially for small communities. I loved introducing our grandson to ours a couple of years ago! Good luck with your challenge! Yay for libraries! Libraries are my second home. I'm happy to comment and am inspired by your donation. Yay!! Yay for libraries. Thank you for doing this :)! I hope you reach your goal! What a great idea! Hooray for libraries! I love libraries! I start taking my kids from the time they are babies and we go almost every weekend! Now all 5 loves books! Go Wisconsin! Go cheese! Go Dairy State! I love Wisconsin! And this challenge. Good luck! Yay, for the libraries, and for you for donating! Thanks for doing this challenge. Libraries need our help now more than ever. Yay libraries! Thank you for your support. That's so cool that you donated a tag reader to the library. I bet the kids love it! I donate a lot of my review books to the library. Thanks so much for do this on behalf of libraries. We all love you! This is a great idea!! Good luck! What a wonderful and generous thing you're doing - good luck and I hope you continue to find wonderful books and community at your library! Libraries are awsome, thanks for supporting them. Thank for your geneosity to your library and for the great blogpost about my book, I AM A BACKHOE. What clever art project! Libraries rock! Thanks for participating in my challenge as well. What a great idea. I love our public library too. All this library love makes me happy! Good luck! Very original idea! Your library is lucky to have supporters like you. Libraries are the seeding ground for book lovers of the future. Thanks for all you do to encourage a love of books Janelle. My grandson loves his weekly visits to pick out books. What a neat idea, Janelle! Thank you for doing this and sharing your idea! We could not survive without our library! Looks like a great library and they must be so happy to have you support them. Thanks for stopping by my challenge too. I've used my local libraries so much I don't know how I could be a working writer without one! All the best with your challenge. I am definitely a lover of my library! There is no way I could share books on so many different things with my daughter. My budget would not allow it. But the library makes it all possible. Good luck to your library and their expansion project. Wowzer! Another lover of libraries. Thanks for taking on the challenge. Wonderful idea - love this:) I do love my local library! I am loving all of these challanges up around the book blogging community! Absolutely wonderful! Sometimes I read a book and listen to one at the same time. I sure would hate to get along without my library. Thanks for contributing! Libraries = awesome.